Devastating floods are almost annual occurrences in the West and in California. With the anticipated sea level rise and other impacts of a changing climate, particularly heavy winter rains, flood management is increasingly critical in California. Compounding the issue are man-made flood hazards such as levee stability and stormwater runoff. One of the city’s more tranquil Delta settings would be the scene of two years of intense construction work, and would have a decidedly different look for decades into the future if a plan to build a floodgate near the mouth of Smith Canal moves forward. The National Flood Insurance Program (NFIP) is mostly viewed as a way of providing assistance to property owners to rebuild in the wake of a flood. But the program has always been intended to do more. Country Club residents are one step closer to shedding a high-risk flood zone designation, after state officials agreed this week to contribute $22 million toward the construction of a gate near the mouth of Smith Canal. Traffic delays are expected in Cathedral City through the rest of 2015 as the Eagle Canyon Dam project enters its final phase of construction. Marshes that rest along bayside Marin could protect communities from storms, flooding, erosion and sea-level rise, according to a new NOAA study. The National Oceanic and Atmospheric Administration study looked at different reports addressing how natural processes protect shorelines — which it turns out they do quite well. Recently, Gov. Jerry Brown and the Legislature announced a $1.1 billion drought relief plan for California. But the $660 million allocated for flood management had many observers scratching their heads. A massive earthquake in the central Aleutian Islands in Alaska could send waves as high as 28 feet crashing into Rodeo Cove near Sausalito, according to data presented Tuesday at Marin’s first-ever tsunami preparedness symposium. The debate over flood control raged for years before the Pajaro River gushed through a break in the levee at Murphy Crossing in the early morning hours of March 11, 1995. The federal government has released a long-awaited $800 million plan to protect Stockton from future floods, but the plan is not as ambitious as local officials would have liked. A tax measure that officials said held the key to combat flooding at Stinson Beach went down to defeat Tuesday night. 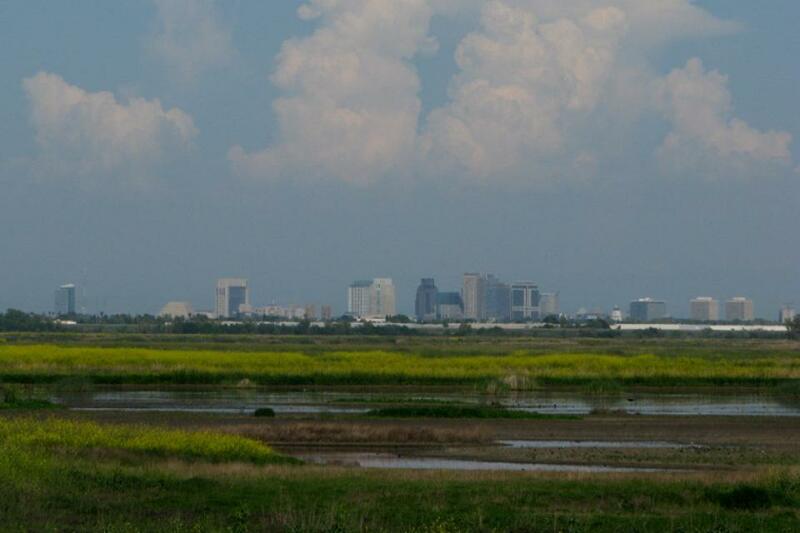 In any lowland, levees define how humans live and how they disrupt native habitats. This is as true for the Sacramento-San Joaquin Delta as it is for coastal Louisiana, Vietnam and the Netherlands. Flood safety in the Delta is a statewide concern because the region serves as a hub for delivering water to most Californians and supports native fish. A December storm that pelted the San Jacinto Valley with rain hit the Soboba Reservation especially hard, severely damaging homes and roadways on the property near San Jacinto. Los Angeles River activists, heartened by the momentum behind revitalization of upstream sections of the waterway, asked water officials on Thursday to return the downstream portion to a more natural state by halting removal of vegetation on the last 11/2 miles of the river. Russian River water managers and consumers they serve in Mendocino, Sonoma and Marin counties got a break Wednesday from the prospect of watching precious water flow to the ocean from the rapidly filling Lake Mendocino reservoir near Ukiah. After decades of debate and delay, plans for flood control improvements in Corte Madera Creek through Ross were revived this week as the key federal agency involved provided $400,000 for planning. Residents of Hamilton City have not left fear of flooding behind them. Yet, hopeful news was found in President Barack Obama’s federal budget. Edward Hitti, the city’s public works director, said officials worked with the Los Angeles County Flood Control District to increase the storage capacity at three of La Cañada Flintridge’s nine catch basins. President Obama has proposed a budget for next year that includes $158 million for Sacramento and Central Valley flood control projects. President Barack Obama has signed an executive order requiring federal projects to meet stricter standards for withstanding flooding that scientists say could worsen because of climate change. Sacramento and San Joaquin valley agencies seeking to reduce flood risk in local cities and suburbs may be eligible for a portion of $150 million in state funds for flood management efforts, the Department of Water Resources announced today [Jan. 26]. 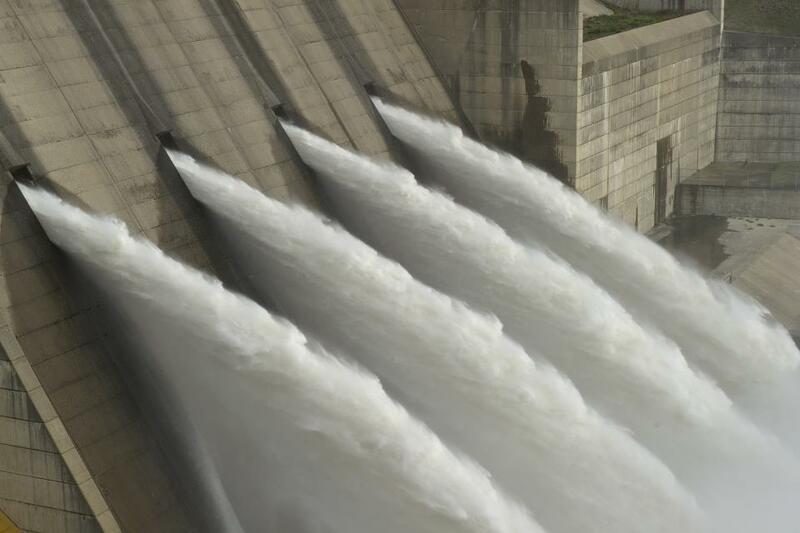 California has committed another $44 million to the Feather River West Levee project — not the entirety of the funding the project needs but enough for construction to continue unhindered in 2015. Even though Californians remain gripped in a brutal drought, high waters will inevitably come again. The past is prelude to the future, and exactly 50 years ago, residents of towns and homes along every stream and river in Northern California were reeling from the most damaging flood we’ve ever seen. The recent flooding and near closure of Highway 101 during storms and high tides is a preview of things to come. … Sea-level rise will happen, no matter what actions we take to reduce greenhouse gas emissions and climate change. The biggest tides of the year are arriving this week, prompting the National Weather Service to issue a flood advisory for the Bay Area Monday through Wednesday and spurring climate researchers to take to the coast for a look at what a future might hold with rising seas. Cars stranded in high waters, traffic backups and the potential for damage to hybrid buses are among the fallout from the low-lying interchange just steps from San Francisco Bay — an area that may provide a glimpse of what’s to come for much of the coastline as sea levels rise amid global warming. A pair of regional flood management studies that are meant to identify problems, look at ways to address the issues and identify funding sources to make fixes has also determined some concerns aren’t easy to rectify. California needs to significantly increase its annual spending on flood protection infrastructure to help close an “investment gap” that places the state’s flood preparedness at risk, legislators were told during an informational hearing today [Jan. 13]. The return of major construction in Natomas is finally on the horizon, thanks to the shoring up of levees protecting the basin from floods. Housing and commercial development could resume in Sacramento’s Natomas region as soon as June, more than six years after flood risks prompted the federal government to shut down construction. Gov. Jerry Brown on Monday declared a state of emergency for Marin, Mendocino, San Mateo and Ventura counties after a series of severe winter storms damaged roads and highways throughout the state. Gov. Jerry Brown declared a state of emergency in four counties Monday after two weeks of heavy rain and winds caused flooding, mudslides and evacuations across California. When the last big December storm was at its peak, overflowing storm drains and flash-flooding streets gave San Jose’s bayside community of Alviso an all-too-real reminder that if not for the levees and pumps, they’d be underwater. By 2050, a majority of U.S. coastal areas are likely to be threatened by 30 or more days of flooding each year due to dramatically accelerating impacts from sea level rise, according to a new NOAA study, published today in the American Geophysical Union’s online peer-reviewed journal Earth’s Future. Ebenezer Scrooge isn’t the only one to visit Christmas Past. Every season our memory, however imperfect, whips out reminders of oft-told tales from a lifetime of Christmases in the wilds of the North Coast. The latest in a string of storms noisily marched across Southern California on Wednesday, hurling lightning bolts, coating mountains with snow and unleashing downpours that triggered a freeway-blocking mudslide before mostly moving on. Marin County officials declared a state of emergency Tuesday, saying last week’s storm caused more than $1 million in damage to county roads and levees. A debris flow has forced the closure of a major Inland Empire freeway after trapping numerous drivers as a new storm barreled into Southern California Wednesday morning. While the Bay Area’s “storm of the decade” left many residents shrugging about its strength (San Francisco got less than 3.5 inches of rain), our infrastructure tells a different story. Local school districts and businesses closed their doors in droves. … Power outages throughout the Bay Area, and overwhelmed sewage systems in different places, including San Francisco, showed how stressed our infrastructure has become. Two local environmental groups filed a lawsuit Thursday in Los Angeles County Superior Court challenging the Board of Supervisors’ recent approval of the controversial Devil’s Gate Reservoir Sediment Removal Project. Californians cleaned up Saturday from a major storm that soaked the drought-stricken state before moving east to drop rain on the Southwest. A fast-moving storm pounded Southern California early Friday, triggering rockslides and mud flows and leaving nearly 70,000 in Southern California without power. The deluge meteorologists warned about, deemed to be the strongest to hit Monterey County in seven years, arrived and it delivered floods, road closures, power outages and plenty of rain throughout Thursday. A dangerous storm system blamed for two deaths in Oregon, thousands of power outages in Washington and flooded roadways in the Bay Area that kept many from work and school pushed into Southern California on Friday, causing mudslides and evacuations. From swift and fluid mudslides to massive and lumbering landslides, gravity and water conspire to pull down the mountain peaks and green slopes that tectonic forces propped up. … As scientists have translated the details, California agencies and local communities have implemented practices to mitigate slide hazards. Mother Nature walloped Northern California early Thursday after three years of drought, bringing a deluge of rain and heavy winds that brought down trees, cut power and wreaked havoc on the morning commute. Heavy rains are predicted for California this week, and after the extreme drought of the past few years, California welcomes the moisture. But can there be too much of a good thing? While drought is a significant natural hazard Californians must contend with, the natural hazards of severe weather and flooding are equally significant in the feast or famine cycle of storms in California. As rain starts to fall in California after a long drought, people’s attention turns to landslides. It is common for hazardous landslides and debris flows to occur in California after heavy rain when the ground is saturated. … USGS conducts scientific studies in several areas related to landslides, climate, and wildfire. A storm expected to be one of the windiest and rainiest in five years pushed across parts of Northern California early Thursday as schools canceled classes and residents stocked up on supplies. … The storm is expected to later pound parts of Southern California before a weakening system moves east through Nevada, Idaho, Arizona and New Mexico. The two seasons in Southern California — dry and wet — will flip-flop for the second week in a row Thursday night as the region seesaws from sunny to soaked. Warm and dry will quickly give way to wet and — for those who live near burned out hillsides — worrisome. High wind and flash flood advisories were issued for the North Bay as the most powerful storm in years was expected to roar through the region early Thursday. … National Weather Service forecasters, citing concerns about floods, mudslides, toppling trees, power outages and extremely hazardous road conditions, advised residents to stay home and be prepared. The rains won’t start in earnest until Wednesday night, but forecasters on Sunday were already warning Northern Californians to watch out for what an incoming storm may bring. Rain is making an absolute mess in San Francisco. … Public works says manhole covers are floating off sewers. Authorities say 14 people were rescued after their cars became stranded in a flash flood in a Southern California community during the third straight day of rain. Dozens of Chinook salmon were rescued Wednesday from a dead-end journey into the Yolo Bypass, the latest of their species to be fooled by a plumbing problem that has gone unfixed for decades. Hours of downpours brought California some relief from a devastating drought and produced few of the problems such as flooding and mudslides that the long-awaited storm had threatened – at least so far. Floodplains are extremely productive habitats for native fish and birds, yet floodplains in California are cut off from rivers by levees and development. … Recognizing these constraints, reconciliation ecology encourages land and water managers to re-engineer human-dominated landscapes to be more hospitable for native species without significantly diminishing human uses. 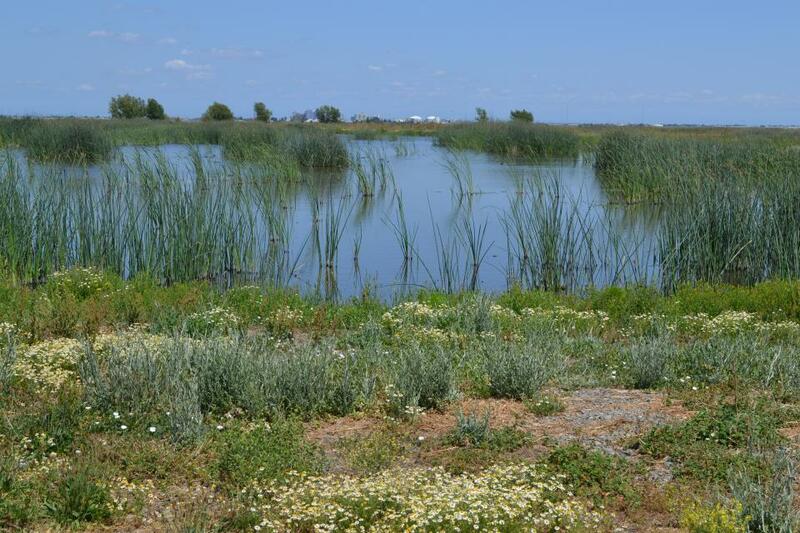 California’s Yolo Bypass, an engineered floodplain on the Sacramento River, is an excellent case study of this new approach to native species conservation. The roads are closed, the voluntary evacuations are issued and the concrete barriers are in place. Now residents and authorities across Southern California are waiting for more rain. Still staggering under $24 billion in debt, the Federal Emergency Management Agency will increase flood-insurance rates up to 18 percent next year for those living in high-risk flood zones, including the Smith Canal area of Stockton. A Pacific storm moved into drought-dry California on Tuesday, bringing hopes for much-needed moisture but fears of mudflows on wildfire-scarred hillsides. Southern California’s foothills and mountains could see 2 to 5 inches of rain Tuesday and Wednesday while the region’s coasts and valleys could receive about half that, according to the National Weather Service. Scattered California storms triggered mudslides in Los Angeles-area foothills scorched bare by a wildfire and dumped about an inch of much-needed rain in the San Francisco Bay Area. Droughts creep slowly. … Floods come in with a wallop. Despite strong opposition from neighbors and recreational enthusiasts, the Los Angeles County Board of Supervisors approved a five-year project Wednesday to remove debris from a basin above Devil’s Gate Dam in Pasadena. The state Office of Emergency Services, believing that the damage the city of La Quinta sustained from September’s storms does not meet the “minimum threshold,” has denied the city’s request for financial assistance to help fix millions of dollars in flood damage to homes, businesses and city infrastructure. We’re in the Rubicon River Canyon, where the King Fire burned 50,000 acres in one day. The pine trees are black and lifeless. Not one pine needle remains on the branches. Marin is the 17th worst place to own a home in the country, almost as bad as Hurricane Katrina-ravaged Forrest County, Mississippi, according to a report from the Weather Channel website weather.com. Earthquake, flood and wildfire risk combined to land Marin in the list of America’s 50 worst places to own a house based on natural factors. Three inches of rain fell across La Quinta within an hour on Sept 8. It was deemed a “700-year storm” … On Thursday, Riverside County Fire/Office of Emergency Services, the California Office of Emergency Services and the U.S Small Business Administration visited 81 homes and businesses in La Quinta, Indian Wells and Thousand Palms. Local state and federal agencies are operating as if it’s flooding, even during California’s drought. Rugged and isolated, the Rubicon River Valley on the border of El Dorado and Placer counties was for many years an idyll of old growth trees and icy swimming holes. … Experts now worry that the devastation and the extreme temperatures of the fire, which scorched much of the soil and reduced its ability to hold together and absorb runoff, could lead to floods and mudslides when winter storms arrive. Crews working on behalf of the Santa Cruz Seaside Co. cut a 10-foot wide channel on the beach at the mouth of the San Lorenzo River on Friday to let river water drain into Monterey Bay rather than continue flooding the basement of the historic Beach Boardwalk. An organization of civil engineers is calling for a national strategy for mitigating flood risks, saying the U.S. has not fully heeded lessons from Hurricane Katrina and Superstorm Sandy. El Niño. is characterized by unusually warm water temperatures in the equatorial Pacific Ocean. El Niño’s storm track affects the location of jet streams. Instead of coming ashore in the Pacific Northwest, the southern jet stream hits California, with increased rainfall and accompanying floods, landslides and coastal erosion. The effects are variable across the state and are more predictable in Southern California. Newly elected to your local water board? Or city council? Or state Legislature? This packet of materials provides you with the valuable background information you need – and at a special price! The story of water is the story of California. 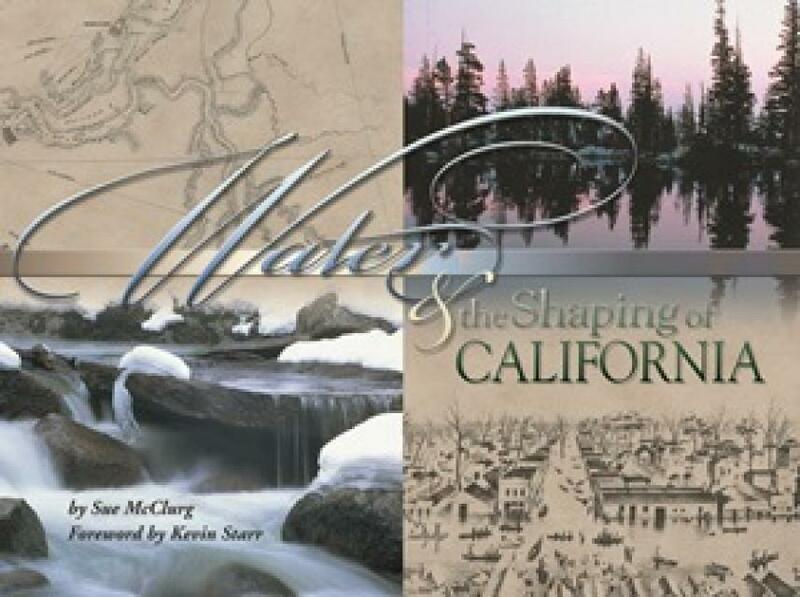 And no book tells that story better than Water & the Shaping of California. The story of California is the story of water. And no book tells that story better than Water & the Shaping of California. This 30-minute documentary, produced in 2011, explores the past, present and future of flood management in California’s Central Valley. It features stories from residents who have experienced the devastating effects of a California flood firsthand. 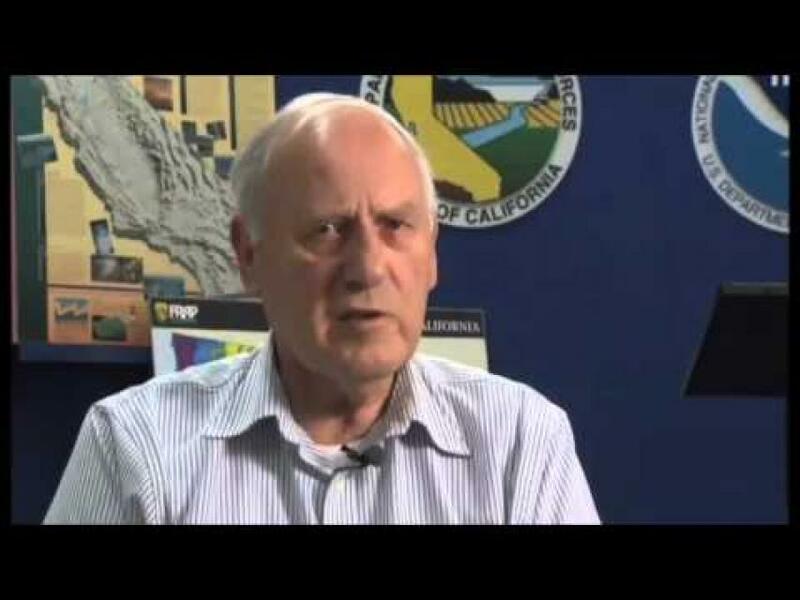 Interviews with long-time Central Valley water experts from California Department of Water Resources (FloodSAFE), U.S. Army Corps of Engineers, Bureau of Reclamation, Central Valley Flood Management Program and environmental groups are featured as they discuss current efforts to improve the state’s 150-year old flood protection system and develop a sustainable, integrated, holistic flood management plan for the Central Valley. 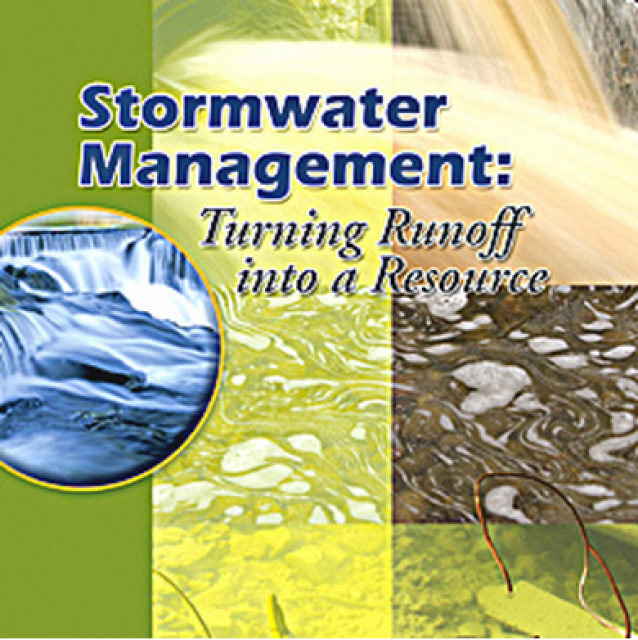 20-minute DVD that explains the problem with polluted stormwater, and steps that can be taken to help prevent such pollution and turn what is often viewed as a “nuisance” into a water resource through various activities. 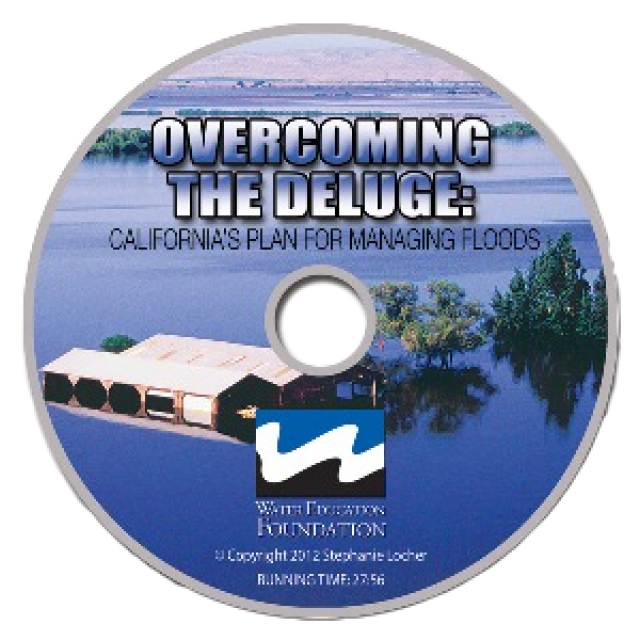 15-minute DVD that graphically portrays the potential disaster should a major earthquake hit the Sacramento-San Joaquin Delta. 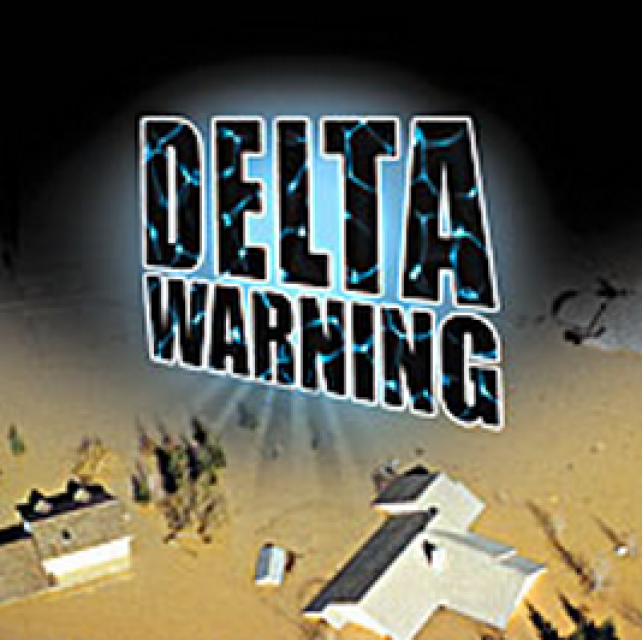 “Delta Warning” depicts what would happen in the event of an earthquake registering 6.5 on the Richter scale: 30 levee breaks, 16 flooded islands and a 300 billion gallon intrusion of salt water from the Bay – the “big gulp” – which would shut down the State Water Project and Central Valley Project pumping plants. 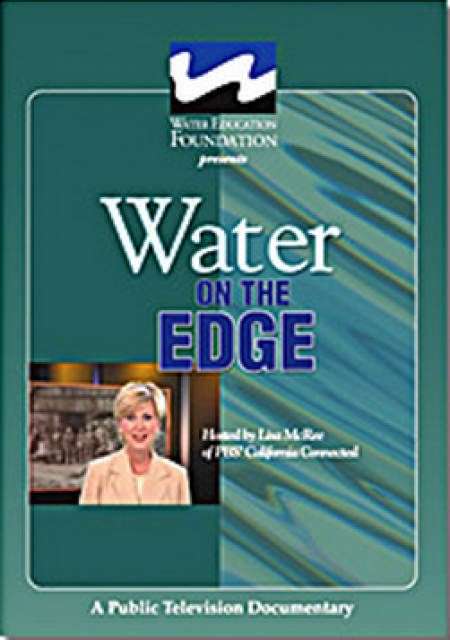 A 30-minute version of the 2005 PBS documentary Water on the Edge. 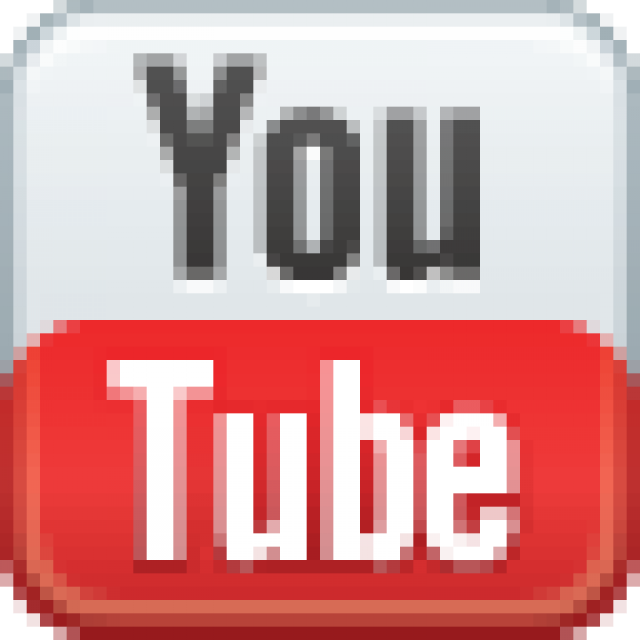 This video is ideal for showing at community forums and speaking engagements to help the public understand the complex issues surrounding the New River. Water truly has shaped California into the great state it is today. And if it is water that made California great, it’s the fight over – and with – water that also makes it so critically important. In efforts to remap California’s circulatory system, there have been some critical events that had a profound impact on California’s water history. These turning points not only forced a re-evaluation of water, but continue to impact the lives of every Californian. This 2005 PBS documentary offers a historical and current look at the major water issues that shaped the state we know today. Includes a 12-page viewer’s guide with background information, historic timeline and a teacher’s lesson. 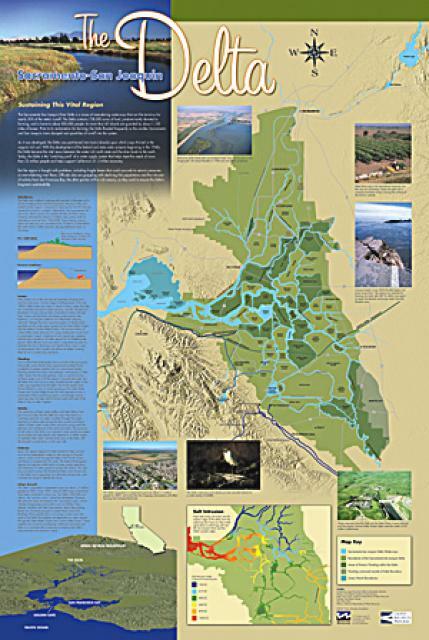 This beautiful 24×36 inch poster, suitable for framing, features a map of the San Joaquin River. 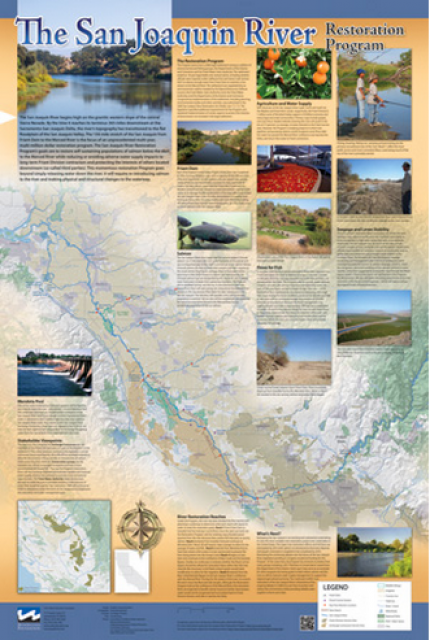 The map text focuses on the San Joaquin River Restoration Program, which aims to restore flows and populations of Chinook salmon to the river below Friant Dam to its confluence with the Merced River. The text discusses the history of the program, its goals and ongoing challenges with implementation. This beautifully illustrated 24×36 inch poster, suitable for framing and display in any office or classroom, focuses on the theme of Delta sustainability. The text, photos and graphics explain issues related to land subsidence, levees and flooding, urbanization and fish and wildlife protection. An inset map illustrates the tidal action that increases the salinity of the Delta’s waterways. Development of the map was funded by a grant from the California Bay-Delta Authority. 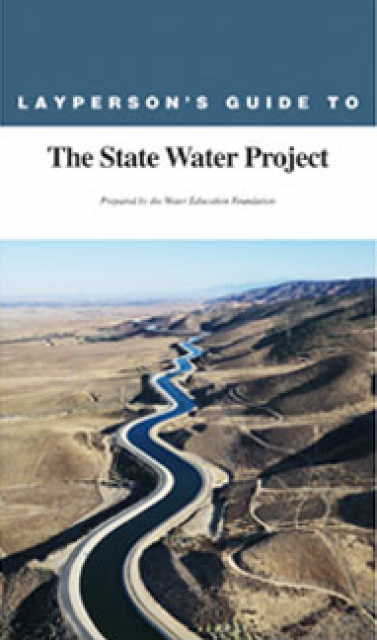 The 24-page Layperson’s Guide to the State Water Project provides an overview of the California-funded and constructed State Water Project. 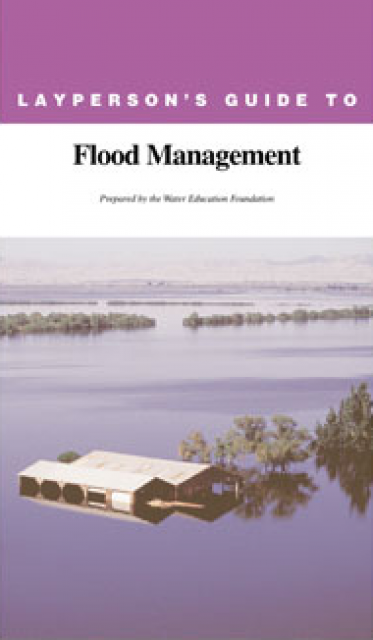 The 24-page Layperson’s Guide to Flood Management explains the physical flood control system, including levees; discusses previous flood events (including the 1997 flooding); explores issues of floodplain management and development; provides an overview of flood forecasting; and outlines ongoing flood control projects. 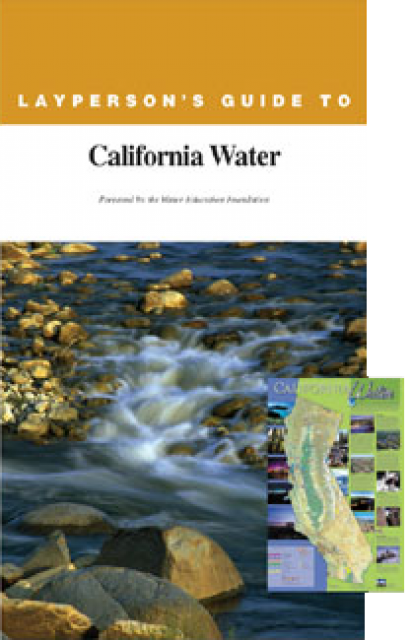 The 24-page Layperson’s Guide to California Water provides an excellent overview of the history of water development and use in California. 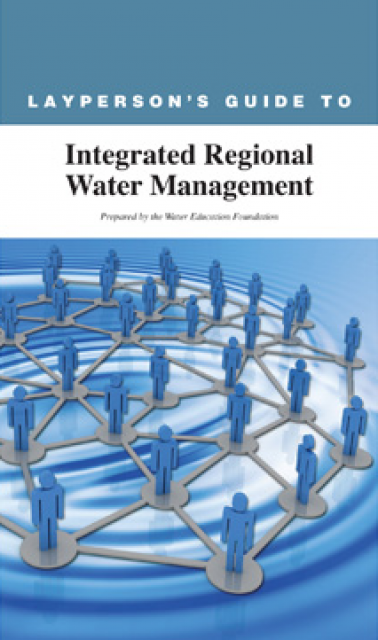 It includes sections on flood management; the state, federal and Colorado River delivery systems; Delta issues; water rights; environmental issues; water quality; and options for stretching the water supply such as water marketing and conjunctive use. 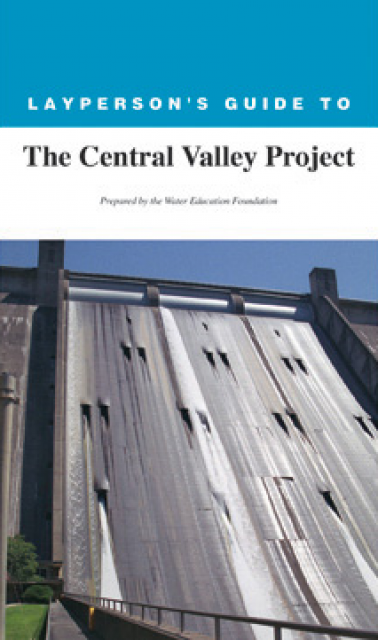 The 24-page Layperson’s Guide to the Central Valley Project explores the history and development of the federal Central Valley Project (CVP), California’s largest surface water delivery system. In addition to the history of the project, the guide describes the various CVP facilities, CVP operations, the benefits the CVP brought to the state, and the CVP Improvement Act (CVPIA). This 2-day, 1-night tour will explore flood threat and flood management programs related to the South Delta and the lower San Joaquin River. Stops include Bear Creek, Paradise Cut, Jones Tract, Smith Canal and San Joaquin River National Wildlife Refuge. Issues of project and non-project levees, floodplain restoration, sea level rise and response to flood emergencies will be discussed. The tour begins and ends in Stockton. 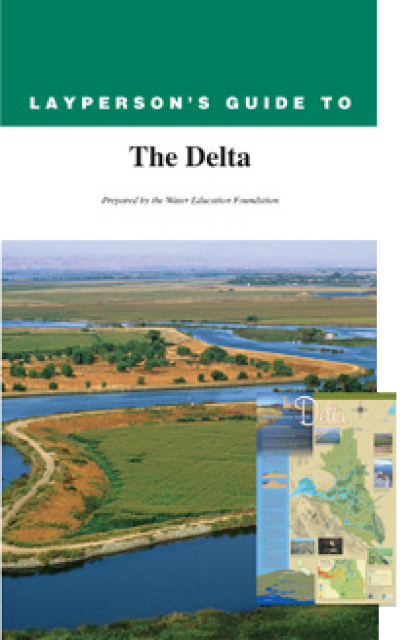 The 24-page Layperson’s Guide to the Delta explores the competing uses and demands on California’s Sacramento-San Joaquin Delta. Included in the guide are sections on the history of the Delta, its role in the state’s water system, and its many complex and competing issues with sections on water quality, levees, salinity and agricultural drainage, and water distribution. A new look for our most popular product! And it’s the perfect gift for the water wonk in your life. Our 24×36 inch California Water Map is widely known for being the definitive poster that shows the integral role water plays in the state. On this updated version, it is easier to see California’s natural waterways and man-made reservoirs and aqueducts – including federally, state and locally funded projects – the wild and scenic rivers system, and natural lakes. 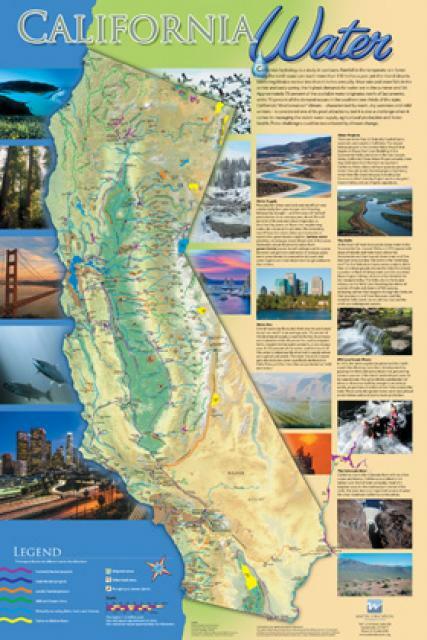 The map features beautiful photos of California’s natural environment, rivers, water projects, wildlife, and urban and agricultural uses and the text focuses on key issues: water supply, water use, water projects, the Delta, wild and scenic rivers and the Colorado River. “When Bob Cullen took a job with the Riverside County Flood Control District, his supervisors put him to work immediately on the proposed Arroyo del Toro channel in Lake Elsinore. Editorial: Want to Buy in a Flood-prone Area and Still Get Insurance? Thank Uncle Sam. “We all — well, most of us — know that global warming means a higher risk of coastal flooding, particularly in low-lying areas susceptible to increasingly intense storm systems. “There’s no easy fix for the National Flood Insurance Program, now drowning in a $24 billion sea of red ink. 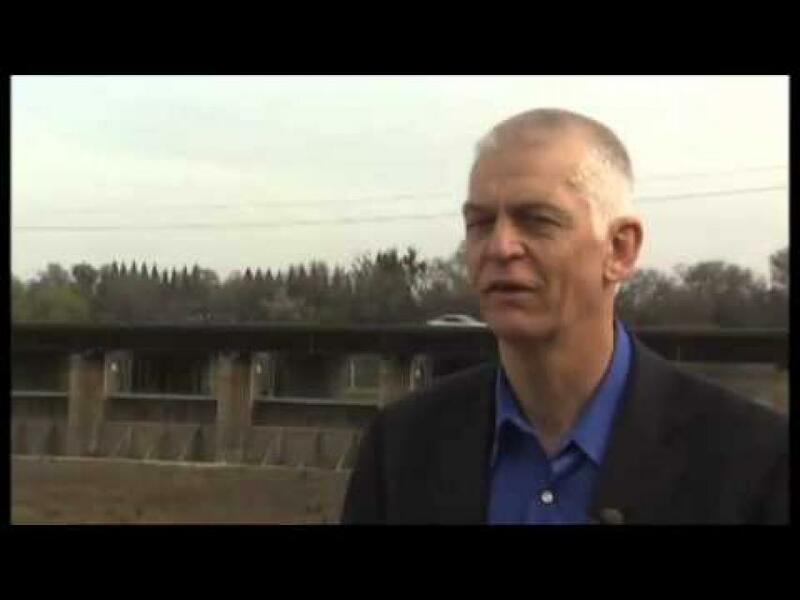 California Drought Dilemma: Drain Anderson Reservoir to Make Dam Safe in Earthquakes? “Glenn County residents are in a celebratory mood after recent approval of $8.6 million in federal funds for the J Levee. “President Barack Obama is set to sign into law a bipartisan bill relieving homeowners living in flood-prone neighborhoods from big increases in their insurance bills. “Two things became clear halfway through a Regional Water Board meeting in Salinas Thursday morning: Everybody wants to cooperate but factions often have differing and passionate views on how to clear the Salinas River channel to prevent flooding. “What you should have in floodplains is not cities, but farms. And of course, if you have farms, you have to have equipment, some structures, some homes. “The House of Representatives, in a bipartisan vote of 306-91 Tuesday night, agreed to limit premium rate increases under the National Flood Insurance Program. “Wait three days after it rains before going into the ocean. “The 2014 levee construction season is shaping up to be like nothing the region has ever seen. “California’s quest for clean water is about to get very, very expensive. With the dual threats of obsolete levees and anticipated rising sea levels, floodplains—low areas adjacent to waterways that flood during wet years—are increasingly at the forefront of many public policy and water issues in California. Adding to the challenges, many floodplains have been heavily developed and are home to major cities such as Sacramento. Large parts of California’s valleys are historic floodplains as well. Despite levees and upstream dams, floods in these areas have caused billions of dollars in damage. When people think of natural disasters in California, they typically think about earthquakes. Yet the natural disaster that residents are most likely to face involves flooding, not fault lines. In fact, all 58 counties in the state have declared a state of emergency from flooding at least three times since 1950. And the state’s capital, Sacramento, is considered one of the nation’s most flood-prone cities. Floods also affect every Californian because flood management projects and damages are paid with public funds. Devastating floods are almost an annual occurrence in the west and in California. With the anticipated sea level rise and other impacts of a changing climate, particularly heavy winter rains, flood management is increasingly critical in California. Compounding the issue are man-made flood hazards such as levee instability and stormwater runoff. Flood forecasting allows flood control managers to predict, with a high degree of accuracy, when local flooding is likely to take place. Forecasts typically use storm runoff data, reservoir levels and releases to predict the rise in river levels. In Northern California the National Weather Service, in cooperation with the state’s California-Nevada River Forecast Center in Sacramento, forecasts flooding. Yolo Bypass occupies a historic floodplain between Davis and Sacramento, California. 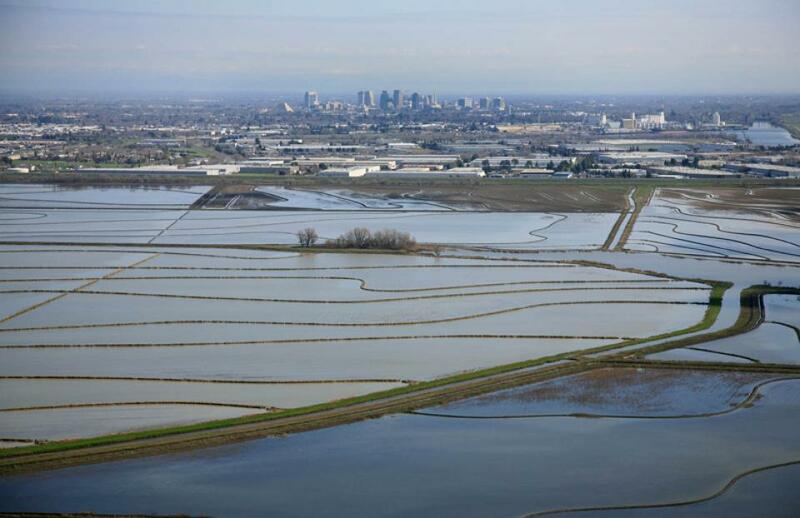 With the city of Sacramento and other area communities prone to flooding, the 59,000-acre Yolo Bypass helps offset that risk while also providing habitat for wildlife. Managed by California’s Department of Water Resources and a part of the Sacramento River Flood Control System, bypass boundaries are defined by constructed levees. The huge floodway is three-miles wide in some parts. Liability for levee failure in California took a new turn after a court ruling found the state liable for hundreds of millions of dollars from the 1986 Linda Levee collapse in Yuba County. 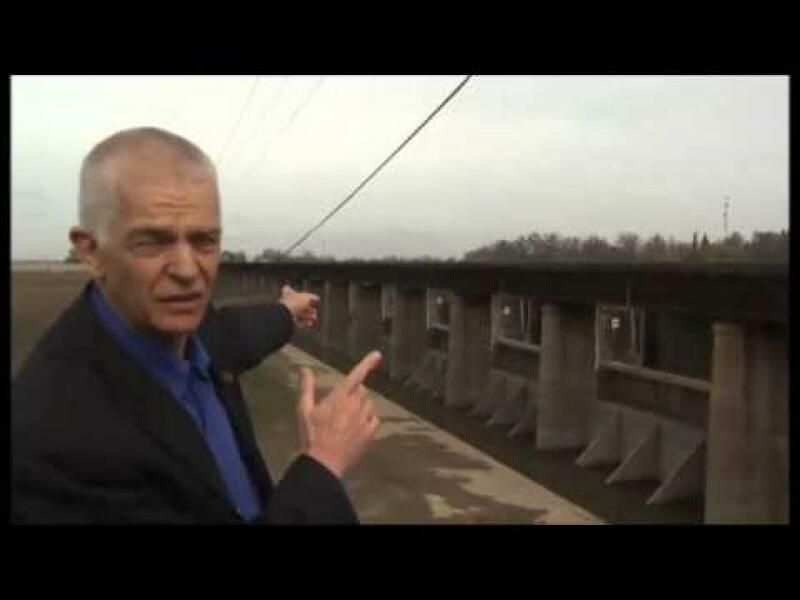 The levee failure killed two people and destroyed or damaged about 3,000 homes. The collapse also had long-term legal ramifications. “Twenty-one billion gallons of rain fall on Stockton any given year, and most of us are content to let it green up our lawns and then swirl down our storm drains. Dams have allowed Californians and the West to harness and control water dating back to the days of Native Americans. At that time, Native Americans erected simple dams for catching salmon. Today, California and neighboring states are home to a vast integrated system of federal, state and locally owned dams that help with flood management, water storage and water transport. Flood management projects, for example, have prevented billions of dollars’ worth of damage and countless lives lost. 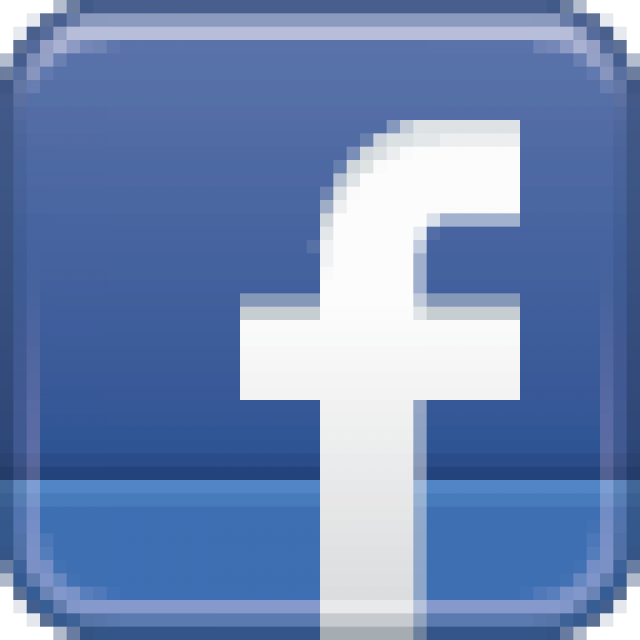 “A large crowd of homeowners came to a meeting with a federal flood insurance representative armed with questions. “EPA researchers studying green infrastructure (using vegetation, soil, and other naturalistic techniques to reduce stormwater runoff) collaborated with colleagues in the Agency’s New England office (EPA Region 1) to develop a new public-domain software app called the Watershed Management Optimization Support Tool (WMOST). “The goal of the tool is to help water resource managers and planners identify cost effective, sustainable green infrastructure options for their local jurisdictions. Blog: Buyouts — A Solution for Flood-Prone Neighborhoods? “It is ironic that Friday’s press conference by Senator (Anthony) Canella, Assemblyman Luis Alejo, Supervisor (Simon) Salinas, and some area farmers was held on the bank of the Salinas River at Hilltown Road (near Highway 68). “In June, the consulting firm AECOM published a report for the Federal Emergency Management Agency, or FEMA, comprehensively analyzing the change in America’s flood risks due to climate change. Its study found that sea-level rise is projected to increase the flood-hazard area in our nation’s coastal floodplain by 55 percent by 2100. “Associations representing the nation’s mayors, counties, cities, stormwater agencies and major California water agencies filed an amicus brief with the U.S. Supreme Court, supporting efforts by a coal mining company to prevent the U.S. Environmental Protection Agency from having the power to retroactively revoke Clean Water Act permits. “BAER (Burned Area Emergency Response) is a multi-agency group that includes USDA’s Forest Service and others, and is responsible for identifying potential threats such as downstream flooding and developing plans to rehabilitate and restore burned areas. “Different versions of a Water Resources Development Act bill have passed both houses of Congress and are awaiting reconciliation. “The latest in a series of efforts to clean up Occidental’s sewage discharge has stalled, ironically, over environmental concerns. “The Department of Water Resources (DWR) has begun an innovative program in the San Joaquin Valley to help local levee-maintaining agencies implement flood control projects while preserving habitat for the endangered giant garter snake. “The ‘advance conservation’ program identifies and sets aside habitat, in this case snake habitat, before agencies begin work that could result in the taking of threatened or endangered species or their habitat. “Big changes in federal flood insurance policy are beginning to strike in the Sacramento area, in some cases quadrupling the cost of coverage and threatening local real estate markets. “It’s the Biggert-Waters Flood Insurance Reform Act of 2012. “Private conservation group River Partners recently acquired 497-acre Hidden Valley Ranch near the confluence of the San Joaquin and Tuolumne rivers using $6.3 million in DWR grants and another $3 million from the Wildlife Conservation Board. “It won’t happen overnight, but flood-control officials took steps Wednesday toward helping Country Club residents escape the burden of mandatory flood insurance. “Anyone who lives in Sacramento has the nagging knowledge that we are the second-most vulnerable to flooding city in the United States. “State agencies this week paid $9.3 million to buy a 466-acre dairy and farm in Stanislaus County near the confluence of the Tuolumne and San Joaquin rivers. “The organization secured voter-approved bond money from the state Department of Water Resources and the state Wildlife Conservation Board. “The stories are part of the legacy of life in a floodplain, where the strength of structures — the levees, dams, bypasses and weirs — bends the natural flow of water to people’s unnatural whims. Every so often, that strength fails. “In 2012, a handful of federal, state and local agencies launched California Flood Preparedness Week. This year, more than 25 federal, state and local agencies and governments are participating in California Flood Preparedness Week (November 4-9, 2013). “California’s vulnerability to flooding creates significant risk to public safety, the environment and the economy. During California Flood Preparedness Week (CFPW), Nov. 4-9, the Department of Water Resources and state, federal and local partners aim to educate Californians about flood risk in their communities and ways to prepare for flooding. To kick off this week-long educational effort, California was today inducted into the Silver Jackets program at a letter signing ceremony in Sacramento. “Two state agencies have collaborated on grants totaling $9.3 million to purchase 497-acre Hidden Valley Ranch on the San Joaquin River near its confluence with the Tuolumne River in Stanislaus County. The Department of Water Resources (DWR) and the Wildlife Conservation Board (WCB) contributed $6.3 million and $3 million respectively toward the purchase, which was finalized today [Nov.
“As autumn turns to winter and rain falls over the charred landscape left behind by the Rim fire, forest rangers and emergency planners have a new worry: water. Commentary: Not Enough Water, L.A.? Look Up. “It was a good line. “As pollution from stormwater runoff increasingly threatens our lakes, rivers, and oceans, it is becoming clear that distributed solutions like permeable pavement, rain gardens, and green roofs will play a key role in addressing the issue. These ‘green infrastructure’ technologies can be installed on and around buildings, from single-family homes to skyscrapers, and can significantly reduce the amount of stormwater that reaches our waterways. “Bipartisan legislation that would delay hefty flood insurance increases for some local farmers and other rural residents may be part of a January resolution to halt another government shutdown. “Threatened with huge fines and possible imprisonment, West Virginia poultry producer Lois Alt decided to stand up to the U.S. Environmental Protection Agency in court. In a case with implications for livestock producers in California and nationwide, Alt tried to sort out whether stormwater discharges from her farm actually require a federal permit. “Pacific Grove and Monterey are embarking on a project to reduce Monterey Bay pollution from storm drain runoff and save always precious water for reuse. “Residents of the Smith Canal area, an area that’s been identified as a flood zone, can be forgiven if they feel they’ve been had. They voted to tax themselves to construct a floodgate at the head of the canal, but until it’s finished five to seven years from now, they will be required to purchase flood insurance. And pay the tax assessment to build the flood gate. “The Yolo Bypass presents one of the most promising opportunities to restore floodplain habitat for native fish in the Central Valley. The 57,000-acre floodway protects Sacramento and the southern Sacramento Valley from floods in wet winters and is farmed each summer. “Marsh Junior High School could be getting rid of a problem the Humboldt Road campus has suffered with since it opened, and get a facility it has needed for just as long. … The school is built on shallow soil over a lava cap. Water flowing over the surface drains into the soil about as effectively as water running over a paved parking lot would. “The federal government’s revamped flood-insurance program is starting to take effect, but the first question for homeowners in Stockton and across the country is yet to be answered: Exactly how much will flood insurance rates go up? “In the foothills of the Watchung Mountains, where tributaries from Green Brook and Middle Brook spill into the Raritan River, Bound Brook [NJ] lies in one of the state’s lowest floodplains. [Hurricane] Floyd left Main Street under 12 feet of water and sent about a third of its 10,400 residents to emergency shelters. 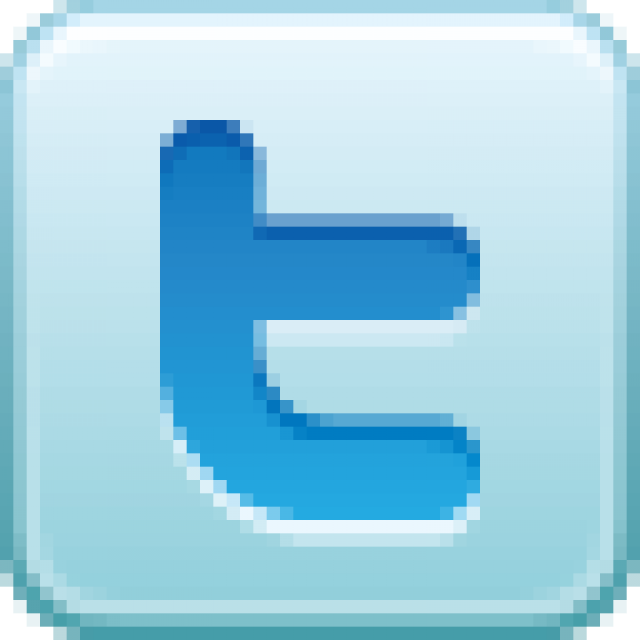 “Bound Brook has spent the ensuing years taking protective action. Its Green Brook Flood Control Project, a $130 million system of movable walls, was about 85 percent complete when Hurricane Irene put it to the test in 2011. Roseville Aims to Have Bigger Voice In Sacramento, D.C.
“When it comes to upcoming changes to flood insurance rates, landowners in Yuba and Sutter counties are in the same boat. “The storms brought chaos to the eastern part of the valley, where heavy rain flooded several streets, prompting road closures and even inundated some neighborhoods. At the city’s retention basins at Avenue 52 and the intersection of Shady Lane, underground pipes were exposed because of severe erosion during a storm on Aug.
“Public agencies that handle water, sewer, and solid waste services in California are required to comply with certain mailed notice and majority protest public hearing procedures in order to impose a new service fee or to increase an existing fee.For the adoption of all other property-related fees, including stormwater and flood control service fees, a public agency must also comply with an additional voter approval process.This voter approval process is referred to as an ‘election’ in California Constitution article XIII D, section 6(c). “The State Water Board is accepting concept proposals through Oct. 17 for Proposition 84 Stormwater Grant Program (SWGP) funding. “The program is awarding matching grants to local public agencies for projects designed to reduce and prevent stormwater contamination of rivers, lakes, and streams. “Farmers protested new water-quality regulations Thursday, saying the proposed rules would bury them in paperwork and chisel away at their profits without necessarily improving pollution. “A new federal program will lead to higher flood insurance rates for some Marin residents living near the bay, but those hoping to find out more will have to wait until the government shutdown ends. “It may look muddy and messy, but a gash torn right down the middle of a south Stockton levee should help some of the city’s most disadvantaged residents avoid the threat of mandatory flood insurance in the future. “As part of Delta Flood Preparedness Week, the Delta Protection Commission is preparing educational materials regarding flood preparedness that will be distributed to Delta residents. “After years of study, legal turmoil, public debate and legislative uncertainty, county planners say it’s going to take another year of staff work, an ombudsman and a citizens committee to figure out how to regulate creekside lots in Marin. “The Central Valley Flood Protection Board refreshed its mission earlier this year and created its first-ever strategic plan as a road map to achieve the Board’s goal of reducing the risk of catastrophic flooding in the Central Valley. On that map is the Folsom Dam Joint Federal Project, which the board visited on September 27 for a briefing on a new auxiliary 2,400-foot spillway, a control structure with submerged gates and a 1,100-foot approach channel. … Led by the U.S. Army Corps of Engineers, U.S.
“Our view: Butte County proved it’s no better than the state government at enforcing environmental rules. When Butte County railed at the state Department of Water Resources for not enforcing water runoff rules against industrial marijuana farmers carving up the foothills, the state agency responded in a way that cast itself in a poor light. “But recent revelations about the county’s grading ordinance indicated the ineptitude in dealing with pot factories doesn’t just emanate from Sacramento. “Reducing and preventing damage from California’s future floods are the goals of 10 new grants to local public agencies by the Department of Water Resources (DWR). Director Mark Cowin approved $91.8 million in Proposition 1E Stormwater Flood Management (SWFM) Grant Program funding awards on September 20, 2013. “Like communities up and down the Front Range, Boulder has long been known to be at high risk for flooding because it sits at the mouth of a canyon and is threaded with creeks. And officials here prepared for the inevitable. “For the past year, Disney has funded a project to remove trash and graffiti along a two-mile stretch of the channel closest to its theme parks.